Unlike previous submarine cable construction booms, companies like Amazon, Google, Facebook, and Microsoft are taking a more active role. These companies have such incredible bandwidth demand for their data center traffic, they're driving projects and route prioritization for new cables. Today we're sharing new graphics about Amazon, Facebook, Google, and Microsoft cables to get a sense of where these content providers are making their mark. And for a running list of content provider cable holdings, bookmark this page. 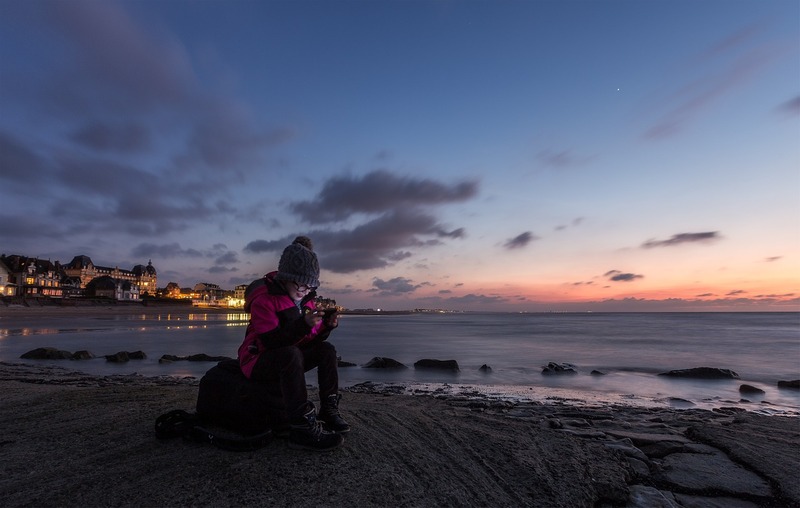 We keep it updated as providers get involved in new cable projects or as similar companies start investing in new builds. Three cables bear the Amazon name: Bay to Bay Express (BtoBE) Cable System, JUPITER, and Hawaiki. The online retailer is a part owner of the former two and a major capacity buyer of the latter. 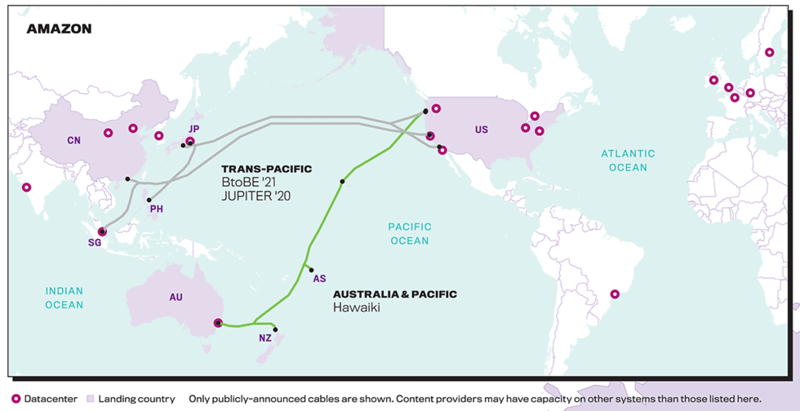 Keep an eye out for the Jupiter cable, which will connect Asia and the U.S. in 2020. This cable will stretch more than 14,000 km and is equipped to carry more than 60 terabits of data a second. Beyond being a part owner of JUPITER alongside Amazon, Facebook is in on the Havfrue cable—one of the five cables we're watching in 2019. Havfrue will be supplied by Subcom and will be the first trans-Atlantic cable to link Scandinavia to North America since the aging TAT-14 cable, which entered service in 2001. This list has several highlights. For starters, the PLCN will be the first direct cable from Hong Kong to the mainland United States. And the Curie cable will be the first new cable to land in Chile in almost 20 years. The INDIGO-West cable also has our attention. It will join the Australia-Singapore Cable as the only other high-capacity cable linking Australia's west coast to Indonesia and Singapore. 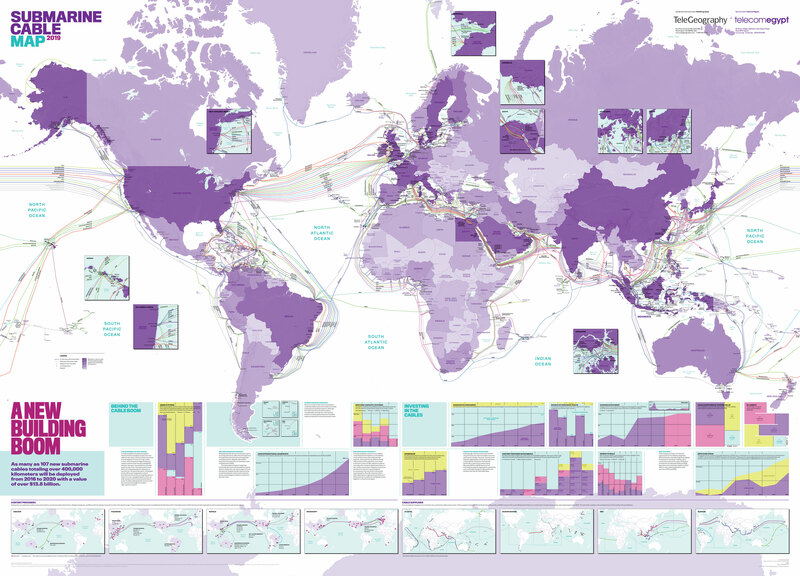 Similarly, the INDIGO-Central cable will be the first subsea cable to directly link Perth to Sydney. Microsoft is in the mix with four major cables: AEConnect-1, GTT Express, MAREA, and New Cross Pacific (NCP) Cable System. The MAREA cable takes a unique path from Virginia, U.S. to Bilboa, Spain. Notably, the cable reaches depths of 11,000 feet below the surface and has the ability to deliver 160 terabits-per-second. Want this map for your wall?